Unicomp Techology is really impressive. The feedback we got from the unit we purchased is so far very good. The client is happy. We have visited Unicomp . It is big company in China . And their engineers are so professional . Nice work on the X-Ray machine! Dear customers, we sincerely invite you to visit Electronica China 2019. 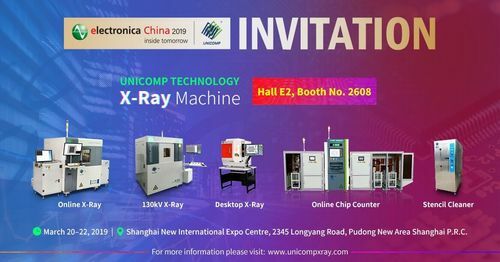 The booth of Unicomp Technology is at Hall E2, No.2608. The exhibition will be hold on March 20-22,2019. It is one of the leading platform for electronic components, systems, applications and solutions, and it has been one of the most important events in Asia since 2002. There are plenty of good reasons to attend electronica China. It will give you broad overview of the entire spectrum of the electronic components industry and give you new drive for your business success. No other trade fair benefits from being embedded in a worldwide cluster as much as electronica China. It attracts international and local market leaders from the industry, showcases products, and addresses all important target groups. In doing so, it creates the best communication and business environment for both sides. Unicomp Technology entered the electronic market in 2002, it owns advanced X-ray technology, rich experience in the design and good quality. 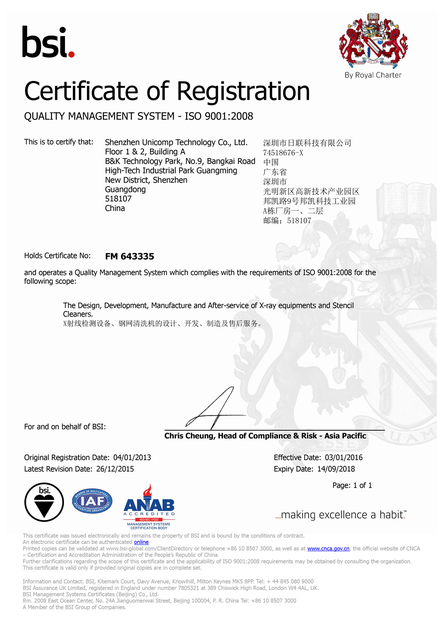 Due to different applications, Unicomp develops various type of machines, such as AX7900, AX8200, AX9100,CX3000, etc. Unicomp X-ray machines is designed to provide high resolution imaging for the electronic industry. 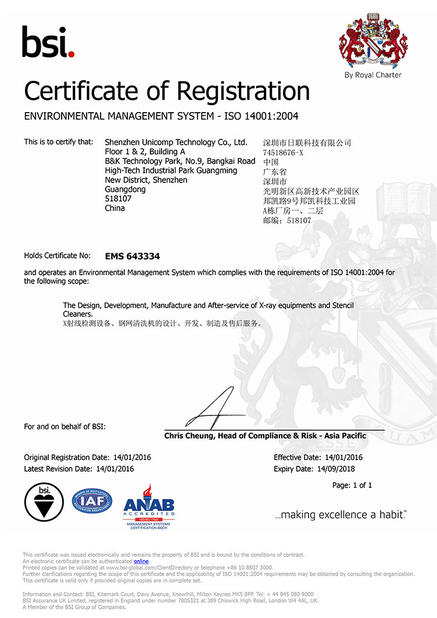 They are used to check the inner situation of SMT BGA, CSP, Flip-Chip, IC semiconductor components, connectors, wire, photovoltaic modules, batteries, ceramic products, and other electronic products. China Good Quality Unicomp X Ray Supplier. Copyright © 2018 - 2019 unicompxray.com. All Rights Reserved.